The Wednesday, July 27, 2016 Climate Justice Forum radio program hosted by Wild Idaho Rising Tide (WIRT) features news about federal, undercover, Bureau of Land Management (BLM) personnel infiltrating and spying on the anti-fracking movement, the dismissal of the lawsuits against blockaders of Shell’s massive Alaska Arctic drilling rig and support vessels from the Ports of Bellingham and Seattle, the state of Idaho pursuit of quicker oil and gas well production records, the Spokane City Council decision to put a measure on the November 2016 ballot that would fine each coal and oil train car traversing Spokane, and a recorded report by two activists who participated in the July 27 protest of a BLM oil and gas lease auction in Boise. Broadcast on progressive, volunteer, community station KRFP Radio Free Moscow every Wednesday between 1:30 and 3 pm PDT, live at 90.3 FM and online, the show covers continent-wide climate activism and community opposition to extreme energy projects, thanks to the generous, anonymous listener who adopted program host Helen Yost as her KRFP DJ. On Wednesday, July 27, at 8 am, dozens of activists from five regional conservation and climate activist groups are holding a “Keep It in the Ground” (KING) rally and protest of the second Bureau of Land Management (BLM) oil and gas lease auction of Payette County federal lands and minerals [1, 2]. 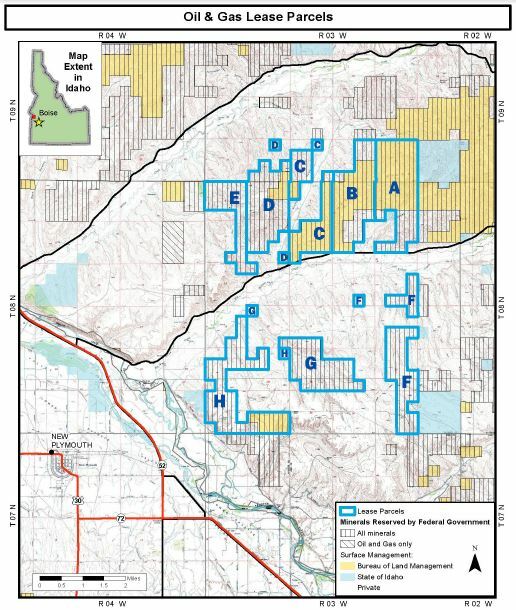 At its Idaho State Office in Boise, the BLM plans to offer and sell leases for fossil fuel development on 9,242 acres of Sheep Ridge public lands around the producing and plugged-pending-pipelines oil and gas wells in the Big Willow Creek area seven miles north of New Plymouth [3, 4]. This protest contributes toward a growing, nationwide Keep It in the Ground movement concerned about the climate warming and environmental destruction caused by ongoing fossil fuel extraction and consumption. KING coalition organizations, such as the Center for Biological Diversity, Friends of the Earth, Great Old Broads for Wilderness, and the Sierra Club, are urging President Obama to expand his climate legacy by stopping new oil and gas leases on public lands, just as he did with coal leases. On June 18, 2016, in Yosemite National Park, the president said that the greatest threat to all national parks is climate change. Groups across the western U.S. are planning similar “Keep It in the Ground” rallies for upcoming lease sales, like the one in Roswell, New Mexico, that the BLM has postponed, and past demonstrations in Salt Lake City, Utah, and Reno, Nevada. The organizations co-sponsoring the rally and protest in Boise on July 27 include Citizens Allied for Integrity and Accountability, Great Old Broads for Wilderness, Idaho Chapter Sierra Club, Idaho Residents Against Gas Extraction, and Wild Idaho Rising Tide (WIRT). Educating the public about and confronting southwest Idaho oil and gas development throughout our five years, WIRT members are grateful and relieved to work with other groups joining the too-few activists under great duress at three previous auctions of public lands and minerals since April 2014 [5-10]. We encourage you to accompany us on the frontlines of public lands liquidation to the oil and gas industry, at this fourth oil and gas lease auction protest in Boise. If you can carpool to and from Boise with other north Idaho activists for this significant demonstration, please contact WIRT by email, phone, or facebook message. Concerned Idahoans are standing up for their rights on Wednesday, July 27, and telling the BLM that public lands in Idaho are not for sale to dangerous extractive industries overrunning our beautiful state. Bring your soft signs, banners, and enthusiasm, and meet at 8 am MDT at the southwest corner of the Walmart parking lot, close to Burger King, near West Overland Road and South Vinnell Way in Boise. The Wednesday, July 20, 2016 Climate Justice Forum radio program hosted by Wild Idaho Rising Tide (WIRT) features news about Spokane and Vancouver, Washington bans and fines of fossil fuel transportation and infrastructure, a federal settlement with six Tesoro refineries to reduce air pollution emissions and violations, resistance to southwest Idaho oil and gas development and a federal lease auction, and other topics. Broadcast on progressive, volunteer, community station KRFP Radio Free Moscow every Wednesday between 1:30 and 3 pm PDT, live at 90.3 FM and online, the show covers continent-wide climate activism and community opposition to extreme energy projects, thanks to the generous, anonymous listener who adopted program host Helen Yost as her KRFP DJ. On July 9 to 12, three north Idaho climate activist groups staged four events for the #StopOilTrains in Idaho Week of Action, joining thousands of people in continent-wide commemorations of the three-year anniversary of 47 lives lost to a Bakken crude oil train derailment, explosive fire, and lake spill in downtown Lac-Mégantic, Quebec, on July 6, 2013 [1 photos, 2-6]. Their successful actions encouraged and enhanced frontline vigilance and resistance to volatile, climate-wrecking oil trains traversing the Idaho Panhandle on Burlington Northern Santa Fe (BNSF) and Union Pacific rail lines, from the Alberta tar sands and fracked Bakken shale fields to West Coast refineries, power plants, and ports. Under rainy skies on Saturday morning, July 9, seven community members attended a social gathering hosted by 350Sandpoint in City Beach Park in Sandpoint. Participants stood around a table under a pavilion tent, networked, and distributed relevant information about climate change issues addressed by various, allied, local groups. Focused on education, organizers welcomed everyone to suggest public events that they could coordinate. At Moscow Farmers Market on the same Saturday, Palouse Environmental Sustainability Coalition (PESC) members talked with dozens of visitors of their outreach table at Friendship Square in Moscow, where they circulated fliers about the Lac-Mégantic disaster and displayed a poster with the written memories of local 2103 Tar Sands Healing Walk participants hearing about the tragedy while attending the First Nations ceremonies in Alberta. Moscow activists also gathered signatures for a petition to Governor Otter asking for his support of “all efforts to prevent oil and coal trains from passing through the state of Idaho” for health and safety reasons. Wild Idaho Rising Tide (WIRT) offered a Skyped oil train watch workshop, presented by Matt Landon of Vancouver Action Network in Washington, on Saturday afternoon, July 9, at the East Bonner County Library in Sandpoint. Seven regional citizens learned methods for widespread, track-side monitoring, documenting, and reporting of Northwest oil train passage during Matt’s third interactive training session in the inland Northwest. Two Occupy activists traveled 75 miles to participate in the workshop, and may provide a fourth session for their Spokane comrades. 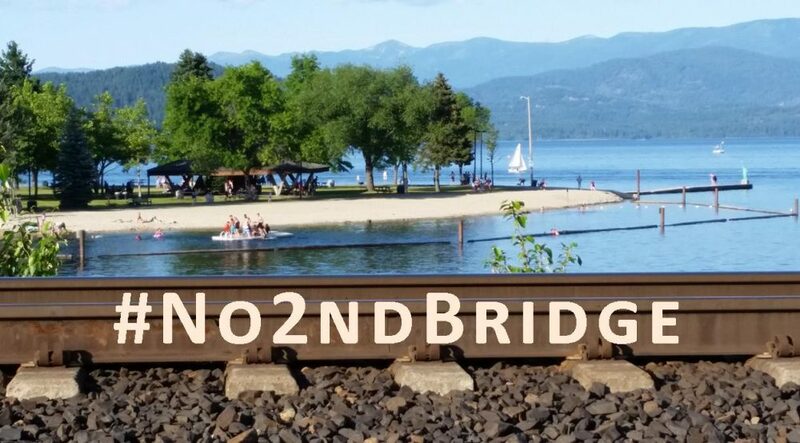 To honor the 47 Lac-Mégantic oil train victims, WIRT and 350Sandpoint held a candlelight vigil and march with protest signs through downtown Sandpoint, from Farmin Park to the BNSF rail line near the Amtrak station, on Tuesday evening, July 12. Despite the solemn spirit of the hour-long demonstration, city and railroad police dogged the seven concerned residents of the vulnerable, rural Idaho, oil train corridor throughout the event. After walking the quiet streets and sharing personal stories and reflections, half of the participants did not finish at the tracks. 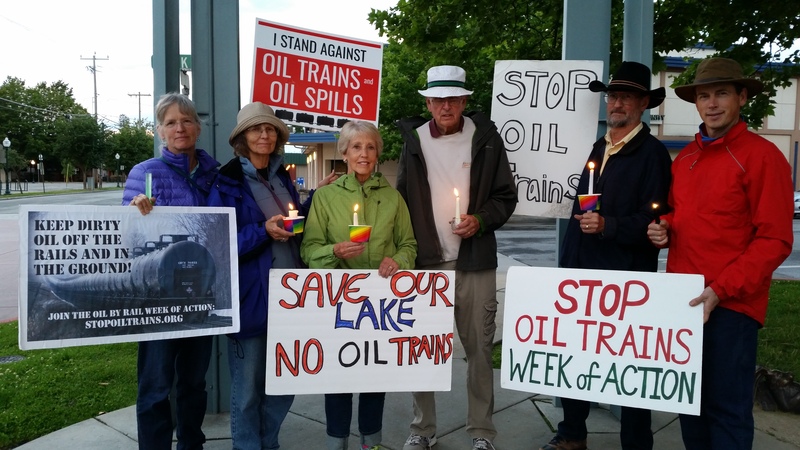 The Wednesday, July 13, 2016 Climate Justice Forum radio program hosted by Wild Idaho Rising Tide (WIRT) features news about three-year anniversary commemorations of the Lac-Megantic oil train tragedy, the Quinault Indian Nation’s demonstration against Grays Harbor oil terminals, #StopOilTrains Week of Action protests throughout the Northwest, and upcoming resistance to a BLM oil and gas lease auction and nuclear waste in southern Idaho. Broadcast on progressive, volunteer, community station KRFP Radio Free Moscow every Wednesday between 1:30 and 3 pm PDT, live at 90.3 FM and online, the show covers continent-wide climate activism and community opposition to extreme energy projects, thanks to the generous, anonymous listener who adopted program host Helen Yost as her KRFP DJ. The Wednesday, July 6, 2016 Climate Justice Forum radio program hosted by Wild Idaho Rising Tide (WIRT) features news about #StopOilTrains Week of Action events and upcoming, summer, indigenous and climate activism, city bans of Northwest crude oil trains and an Oakland coal export facility, and other topics. Broadcast on progressive, volunteer, community station KRFP Radio Free Moscow every Wednesday between 1:30 and 3 pm PDT, live at 90.3 FM and online, the show covers continent-wide climate activism and community opposition to extreme energy projects, thanks to the generous, anonymous listener who adopted program host Helen Yost as her KRFP DJ. 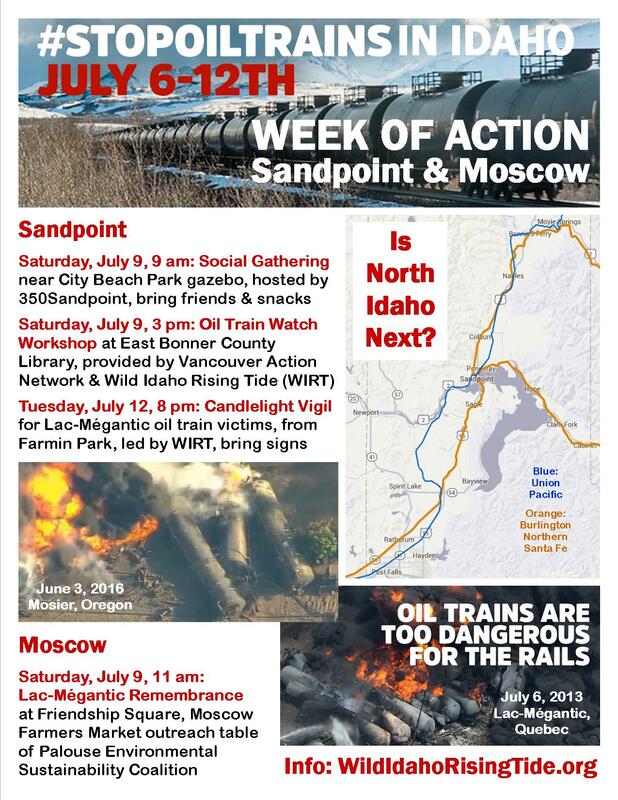 North Idaho activists invite the public to join them at four events on July 9 and 12 commemorating the 47 lives lost to a Bakken crude oil train derailment and explosion in downtown Lac-Mégantic, Quebec, on July 6, 2013. During the three years since this tragedy, dozens of similar, fiery accidents have risked and wrecked public and environmental health and safety and the global climate – more than in the previous four decades – including the Union Pacific oil train derailment, spill, and fire in the Columbia River Gorge town of Mosier, Oregon, on June 3, 2016.